We’ve all heard of David Royer from his phenomenal ribbon microphones, but did you know that his first and original love was for that of the tube microphone design? In fact, David Royer started Mojave Audio in 1985 in his own garage doing custom-shop style microphones and mic-mods. But it wasn’t until recently that he ”re-founded” Mojave Audio as the base company for his tube-line of microphones. David Royer is an absolute genius in more ways than one, including microphone design – but why not build on the same great Royer name he had already begun? ..In other words, branding. His first official microphone in the Mojave Audio brand was the MA-200. This large-diaphragm, tube condenser microphone is quite a nice value, I’m quite convinced of this personally. I have used a vast selection of microphones of many different manufacturers at all levels of pricing and I can honestly say that the MA-200 truly is one of the better-sounding microphones on the market today, and surprisingly affordable! The out-of-box experience when you receive your new MA-200 microphone is quite a pleasant one. It certainly was to me when I took home the MA-200 for the first time! 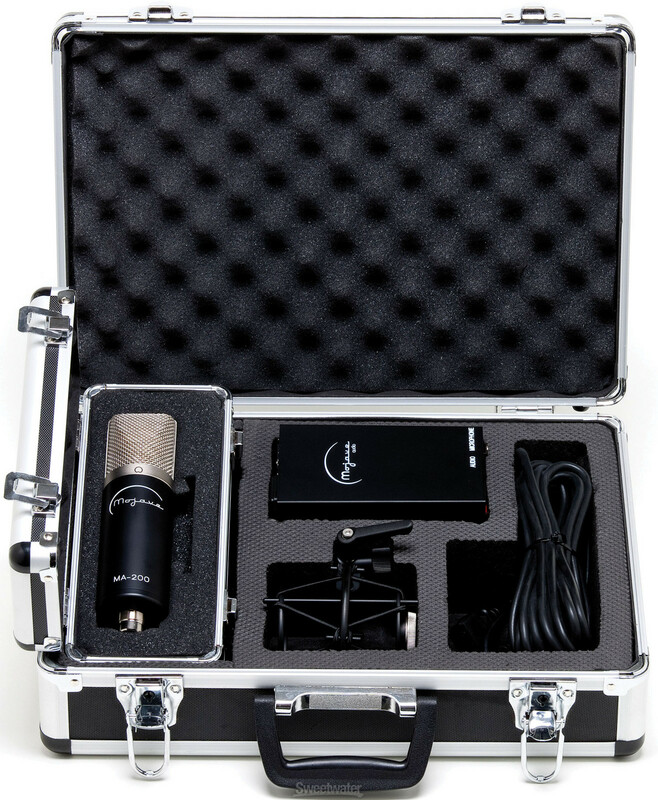 As you can see from the picture on the left, the MA-200 and all of its accessories ships in a customized hard-shell case that will protect everything not only in shipping, but also if you wish to take it on the road to a live event. I have used the MA-200 live on MANY occasions, so this is quite useful indeed. Because tube microphones require additional power for the tube itself, it’s no surprise there is a power supply included – but they didn’t cut corners just because the microphone doesn’t cost like it sounds. As with other tube-microphones, the XLR cable to the mic-pre connects to the power supply and not the microphone directly. Instead, a special cable is included that inter-connects both the microphone and its power supply. In addition, a good quality shock-mount is also included. This shock-mount locks into the microphone, allowing you to suspend the MA-200 upside down, or place it in other tricky locations such as over a drum-kit, inside a kick drum, under a piano, etc (more on that below). But last is the MA-200 microphone itself. 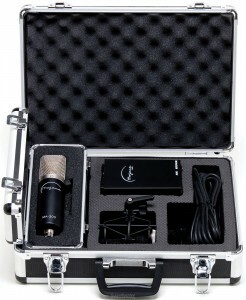 Along with the large-case, a smaller case is also included just for the microphone. To say the MA-200 sounds great is an understatement indeed. The reason so many microphones exist is that recording music is an art-form, the mics are our paint to capture the imagination. Like paints, they have their own color – as do the microphones we use. If you’re looking to re-produce the original sound of an instrument, then the Mojave Audio MA-200 is about the last microphone you’d use. But if you want a lush bottom end that is clean and detailed on the highs, the MA-200 is great. I have used the MA-200 on everything from both inside and outside of a Kick Drum, as a stereo pair for Drum Overheads, directly on an Acoustic Guitar, in stereo on a Grand Piano, and on electric guitar cabinets both in the studio and even in live concerts! I’ve even used the MA-200 microphones on a choir, and of course lead vocals. It’s hard to use the MA-200 and not love the texture that it brings. It is, after all, a David Royer microphone. 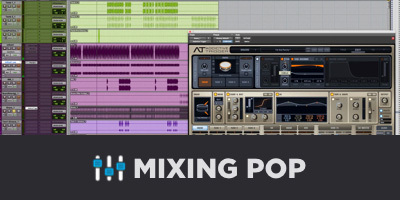 For more info, links, and tech specs on the Mojave M-200, check out our friends @ RecordingHacks.com! I'm a seasoned veteran in the audio industry with over 20-years of professional experience. 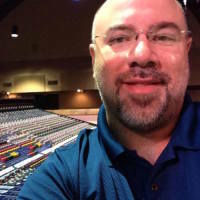 I started young touring as the lead keyboardist for Andrew Lloyd Webber's "Joseph and the Amazing Technicolor Dreamcoat" and a few other musicals, but I found my calling in doing production and systems design. I have my own ProTools HD studio and have been mixing and mastering for about 10-years. I was a top industry sales consultant for 15-years working with some of the biggest names in the business. Don't let this scare you--I'm very down to earth, honest, and passionate about what I do. I offer expert consultation and studio design on my own--NO SALES involved, so you know you're getting nothing but the honest truth!